Although they grew up under the same roof and shared the same last name, William II and Charles Brickell were very different people. Charles was considered a well-dressed gentleman and liked to socialize with Miami’s upper class. On the other hand, William II was considered gruff and not afraid to get his hands dirty. He was often hands on with the projects he supervised on Brickell Avenue. The two brothers had a very intense sibling rivalry. When Charles used part of the family land to build a luxurious apartment building, William II refused to be outdone by his brother. He decided to build a bigger and more elegant structure directly across the street from his brother’s Brickell Apartments. The rivalry was so apparent and well known that the Miami Herald referred to William’s apartment project a “spite fence”. The oldest son of William and Mary Brickell had his first child in 1910. William II and his wife, Olive, named their daughter Mary out of respect for his mother. Eight years later, William II would honor his mother by using her maiden name for his elegant and grandiose apartment building. In the same year as the birth of his first child, William Brickell II built a stately mansion for his family. The mansion was located at 617 Brickell Avenue. It was a spacious, white, wood frame building that was set to the back of the lot on Brickell Avenue. Many homes on Brickell Avenue were placed well off the street for additional privacy and quiet. The home was located just south of where William and his siblings grew up on Brickell Point. The Brickell Avenue neighborhood looked more wilderness than suburban at the time William II completed his home. The area was scenic and rather tranquil for being so close to downtown Miami. William II and his wife, Olive, had another child a year and a half later. William III was born on October 29, 1911. He was the second and last child for the couple. As Armistice Day marked the end of World War I, William II decided to make a change. His home was certainly big enough to accommodate his family, but his competitive nature would not let his brother be the only proprietor of rental apartments in the Brickell area. 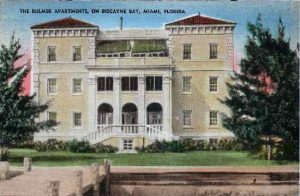 In 1918, William II decided to build an apartment complex that would overshadow his brother’s Brickell Apartments. As the war concluded, the sacrifices made by all Americans created pent up demand for change. Many northern residents decided they would spend their winters in a warmer climate. Soldiers who trained in Miami chose to return and make Miami their permanent home. The influx of new residents, whether seasonal or permanent, created a big need for new housing. Charles Brickell saw the opportunity in 1917 and quickly erected the Brickell Apartments. While it was an impressive building, his brother was focused on creating an even more impressive apartment complex. In 1918, William II hired August Geiger to design an imposing and impressive building. He then hired John Orr, a builder from Scotland, to oversee the construction of the architectural wonder that Geiger designed. The orange-colored, Italianate designed building featured four three-story towers with pyramidal roofs, a projecting central pavilion, and a portico with six Corinthian columns at the front entrance. The building was originally designed to be nine stories, but due to post-war shortages of building materials, it was capped off at three stories. Every apartment unit in the building had at least three bedrooms. Some apartments were designed to allow the combination of two apartments into one. The Miami Herald described the feature of combining two large apartments into one as necessary to “give tenants elbow room”. William II’s apartments were designed to be both spacious and luxurious. Either as a gesture to honor his mother or an act of sibling rivalry, William II named his apartment complex after his mother’s maiden name. From the time it opened, the Bulmer Apartments became the larger and more impressive rental address in the Brickell neighborhood. It was said that Louis Comfort Tiffany was the first resident, or guest, in the Bulmer Apartments. 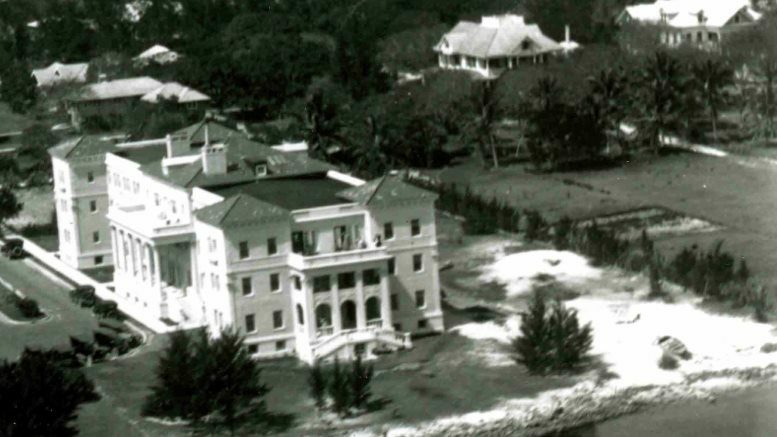 Tiffany would build his own unique and impressive mansion at 1865 Brickell Avenue in 1921. His home was designed in the shape of an octagon, which had one neighbor refer to the mansion as the oddest structure he had ever seen. William II’s family moved from 617 Brickell Avenue to the Bulmer Apartments as soon as it opened. The apartment building remained under ownership of the Brickell family until the early 1970s. In addition to residents, the Bulmer Apartments accommodated businesses as well. One of the early organizations to operate out of the apartment building was the Belmore Tutoring Studio. This institution was a preparatory academy for young men aspiring to higher education. Professor Belmore was a graduate of Harvard College and Harvard Law School. 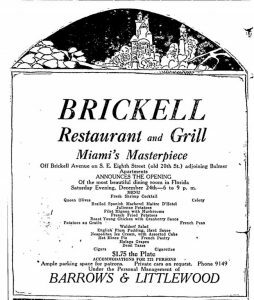 On Christmas Eve of 1921, the Brickell Restaurant and Grill opened just to the west of the Bulmer Apartments. The restaurant was opened by Barrows and Littlewood. The same group ran a restaurant in the Columbia Building, in downtown Miami, called Barrow’s Restaurant. The opening of the restaurant included all of the pomp and circumstance of the Christmas season. The guest list included many prominent residents of Miami including: William and Olive Brickell, August Geiger, the Pancoasts, and Glenn Curtiss and his wife. The restaurant was decorated with roses and Christmas decorations. The opening also featured an orchestra playing live music. The kitchen and dining room occupied the first floor. Private dining rooms were located upstairs. The inside of the restaurant consisted of a combination of tile and wood. The tables were made of ivory enamel and the chairs consisted of ivory as well as accented with smart furnishings. The place was an elegant and popular destination for Southside residents. Southside was a common name for the neighborhood that we call the Brickell today. The restaurant provided a destination within walking distance to the residences of the Bulmer and Brickell Apartments. Unfortunately, it only remained open for three years. By January of 1925, there were ads in the Miami Herald real estate section trying to lease the vacant restaurant. During an interview with Dr. Paul George in the 1990s, William and Olive’s only son recalled his memories growing up in the Bulmer Apartments. William III remembered a very different Brickell in his youth. During prohibition, William III recalled watching men back up their trucks to pick up illegal contraband that was dropped off by rum runners. 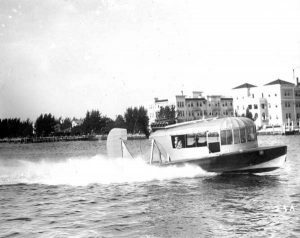 The rum runners would travel from the Bahamas to Miami by speed boat, and then dock their boats to drop off illegal liquor at a pier which was adjacent to the Bulmer and Brickell Apartments. William III remembered that no one seemed too worried about getting caught. The rum running generally happened in broad daylight and out in the open. Miami was considered one of the leakiest places in America during prohibition. He also remembered that it was during the 1926 Hurricane that the Brickell family lost so much of their family documentation and memorabilia. Following the death of Mary Brickell, William II had held on to a lot of the family documentation in a storage area on the ground floor of the Bulmer Apartments. While the building stood strong during the storm, the first floor flooded and the family memorabilia was destroyed by water damage. This may partly explain why there are so few pictures of Mary Brickell available today. Although outliving his brother Charles by seven years, William II passed away on September 6, 1931 at the age of sixty seven. He died in Essex County, New York, from an illness he contracted while he was traveling. William’s funeral service was held in the Bulmer Apartments and was officiated by Reverend Livingston Munro of the Holleman Park Methodist Church. William II aided in the construction of the church. He was buried in the Woodlawn Cemetery by W.H. Combs Funeral Home. The Bulmer Apartments were left to his widow, Olive. Olive and her two children continued to live in the apartment building for many years following the death of the patriarch. 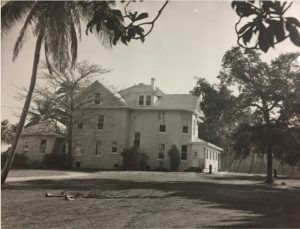 Although the Brickells hadn’t owned the home at 617 Brickell Avenue since 1918, it did remain standing at the same location until February of 1958. The property changed hands a few times and was owned by the Claughton Family when the property was leased to an investment group headed by former Miami Mayor Abe Aronovitz. The lease gave the investment group the right to knock down the Brickell mansion. The group took advantage of this right to clear the land for a new development. The plan was to erect a twenty one thousand square foot office building and three twenty-unit garden apartment buildings. The project was designed by Architect Henry Hohauser. 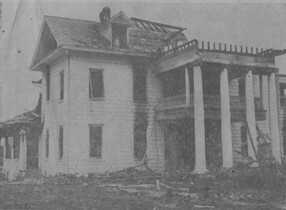 The mansion was demolished on Wednesday, February 26, 1958. Its demolition was the beginning of a string of demolitions of former Brickell family homes. Between 1958 and 1961, all of the mansions that were built and occupied by Brickell family members along the avenue that bore their name became victims of the wrecking ball. The Bulmer Apartments stopped operating as an apartment and rooming house at some point in the late 1950s or early 1960s. Olive Brickell still owned the property and she continued to use the building as a winter residence until her death in March of 1966. William III and his wife took possession of the apartments until they sold them to Flagship Bank in the early 1970s. At first, Flagship Bank considered renovating the old apartment complex and using it as the centerpiece of a larger development. However, a feasibility test was done, and it was determined that it would not be economically feasible to renovate the old building. The bank rejected the idea. Officials of the Dade Heritage Trust began a campaign to save the Bulmer Apartments in 1977. They conducted an historical survey and offered several ideas to preserve the iconic Brickell neighborhood structure. One of the ideas was to have University of Miami students take on the renovation effort to make the project cost feasible. The Villagers also got involved with the preservation effort and had an architectural expert come down from Jacksonville to provide an assessment. Herschel Shepard inspected the building and submitted a report on July 5, 1978. Shepard’s report was negative about the architectural significance of the building. In addition, he estimated that it would require as much as a one million dollar investment to renovate the iconic structure. In a rather sudden move, Steve Hudson of Flagship Bank announced the sale of the building and property to The Raymond D. Nasher Company of Dallas, Texas, for $5.6 million. The announcement took place on Tuesday, July 11, 1978. The wrecking ball began swinging later that day. Despite having a six thousand pound wrecking ball at his disposal, the crane operator, Kenneth O’Farrell marveled at how strong and well-built the structure was as he worked hard to knock it down. O’Farrell was interviewed by the Miami Herald, and he was quoted as saying “That’s one strong building”. It certainly explains how it was able to withstand so many South Florida hurricanes. Following the demolition of the apartment building, the Nasher Company built a thirteen story office building. As part of the agreement of the sale, the Flagship Bank leased back four stories of the new building. The building was completed in 1980. The office building still stands today. It is the Sun Trust building at 777 Brickell Avenue. Much of the property where the Bulmer Apartments stood is a combination of park and parking garage. The empty Brickell Mausoleum is the last structure built by the Brickells that still remains in the heart of the Brickell neighborhood. The demolition of the Bulmer Apartments represented the end of an era. It was the last residential or commercial building built by a Brickell that was demolished. While commercial viability has to factor into any real estate transaction, many who appreciate Miami’s past see a tragedy in not preserving at least one of the Brickell buildings during the transformation of the neighborhood. In many ways, the modernization of the Brickell neighborhood was inevitable. The weather is great and the proximity to the bay provides for a unique and beautiful area to live and work. However, it is hard to imagine that almost all of the contributions of the Brickell family have been erased in the name of progress. While we can appreciate the neighborhood’s past in old photographs, it is not the same as having at least one of the beautiful, ornate buildings still here to represent the family. The Bulmer Apartments would have been a great reminder of the pioneer spirit of the Brickell family. Cover: Aerial of Bulmer Apartments. Courtesy of Florida Memory. Figure 1: William III Home at 617 Brickell Avenue. Courtesy of HistoryMiami. Figure 2: Bulmer Apartments Postcard. Courtesy of Arva Moore Parks. Figure 3: Brickell Restaurant & Grille Ad in 1921. Courtesy of the Miami Herald. Figure 4: Bulmer & Brickell Apartments in 1930s. Courtesy of Florida Memory. 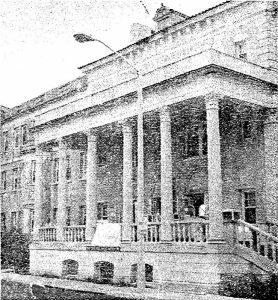 Figure 5: Brickell Mansion demolished in 1958. Courtesy of the Miami Herald. Figure 6: Bulmer Apartments in 1973. Courtesy of the Miami Herald. 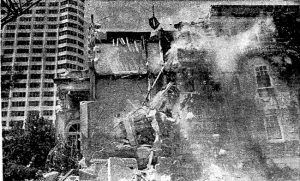 Figure 7: Demolition of Bulmer Apartments in 1978. Courtesy of the Miami Herald. 2 Comments on "The Bulmer Apartments"
It makes me sick to learn of the destruction of virtually all of the Brickell family’s historic buildings. It is consistent with the destruction of my home town over the years. I, like thousands of former Miamians, am a displaced former majority resident. My grandfather, Charles A. Cox moved to Miami from Theressa, FL in 1905, lived with my grandmother somewhere near the mouth of the Miami River. He knew the Brickell family. He worked for the Moore family (Moore Furniture) for over 50 years before retiring. My dad, Charles A. Cox Jr. was born in 1911, delivered at home in Lemon City by Dr. John DuPuis. He graduated form Miami Edison HS (formerly Dade County Agricultural HS) in 1932. He was a City of Miami police officer for 30 years, before retiring in 1969. My great-uncle, William Cox owned and operated a Texaco Service station located on NW 7th avenue and 62nd street for many years. All of my family had an abiding love for our beautiful hometown, Miami, hurricanes and all. I was born in Victoria Hospital in 1936, graduated from Miami Jackson Sr. HS in 1954. I played football in the Orange Bowl stadium. Many years later, I completed two Orange Bowl Marathons which ended on the playing field of the Orange Bowl. As a native Miamian, these were some of the greatest days of my life. Except for the memories of my beautiful home town, everything else is all gone. I am not amused. Casey Piket, great job and compelling piece, as always. Very much enjoyed the read.